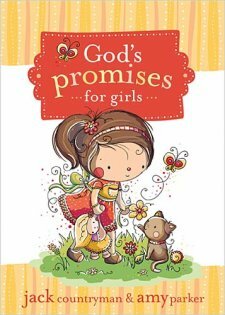 God's Promises for Girls is a wonderful children's book for young girls. My 6-year-old daughter loves it, and girls ages 5-10 would most likely enjoy it - although my daughter says 3-year-olds would enjoy it too. It is an age appropriate resource with scriptures listed topically by subject. It is a great tool for teaching young children the Word of God and for teaching them to go to God's Word when they have questions. Each topic is presented clearly with a rhyming verse that makes it fun to read. It is then followed by the Bible verses that relate to the topic. Each topic is presented in a simple and fun format on two pages, along with illustrations. It is put together beautifully, with much thought. The illustrations and colors, along with the poems, make it an appealing book to children. I think it is a great little book and would recommend it for any young girl. My daughter and I enjoyed it very much and I'm sure she will return to it again and again.